This video provides a short overview of the evidence for global climate change. It needs to be supplemented by more thorough materials and activities. Use as a prompt - ask students what they think is happening in Arctic if temperature is changing by only a degree. Best used in conjunction with the other 10 short videos in the series. A brief overview of the evidence that Earth is heating rapidly. The claims made in this video are not supported by references in the video or on its webpage. Comments from expert scientist: This video provides a nice broad overview that the planet is warming and provides examples of the impacts of a seemingly small increase in global average air temperature. 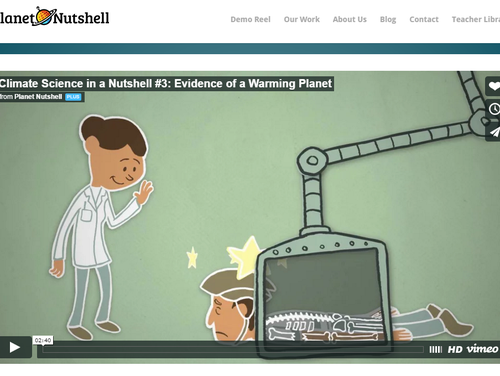 The breezy style and playful animations of this video will likely engage most students. It lacks a teacher's guide, background materials, etc. that would support its use in a classroom. This is a HD video that can easily be projected in a classroom.